Whoever does the market research at New Age Caravans, is bang on the money! 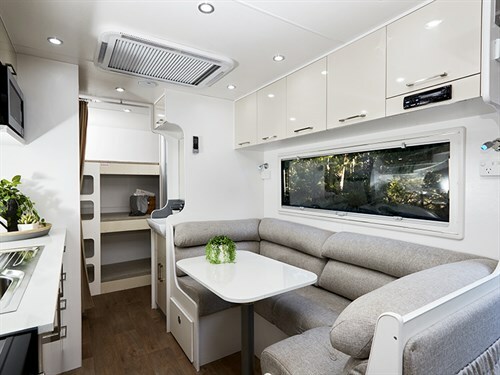 Take the New Age MR20BC (Bunk Combo) for instance; it's contemporary interior and ample storage make this perfect for the whole family. Actually, it’s not rocket science, as statistics suggest that more young families are adopting a caravanning lifestyle than ever before. 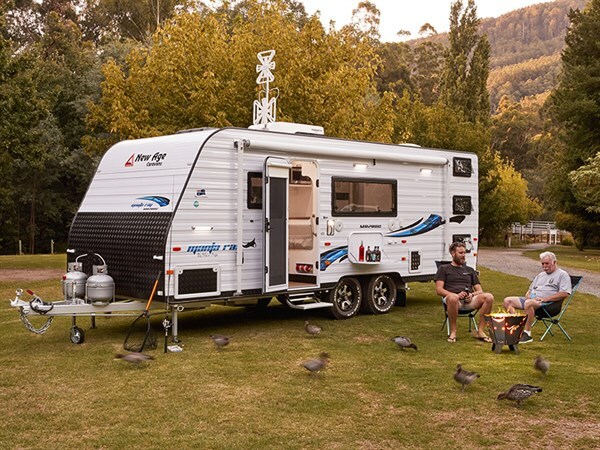 According to peak national body, Caravan Industry Association of Australia — based on Tourism Research Australia’s tourism figures — the 30- to 54-year-old age group accounts for 47 per cent of the domestic caravan and camping economy, at 5.5 million trips per annum. That predominantly includes the 34-55 (family market) target demographic. Yes, family caravanning has not only rejuvenated, it's a burgeoning industry. Obviously, it’s the younger generations who are behind the resurgence in popularity of caravan and camping holidays taken by Australians. The MR20BC is not armoured or designed to tackle Cape York, Gibb River Road, or the Birdsville and Tanami tracks, but where it shines is in the ‘family fun’ department. During an overnight jaunt at Warburton Holiday Park, I was accompanied by CW’s senior editor, Tim van Duyl. Now Tim’s a DINK (double income, no kids), but even he was impressed with the bunk combo. Certainly, upon nightfall it made for a stunning silhouette under the spotlight of the moon and star-filled sky. Internally, the MR20BC is perfect for the modern family. The main bedroom (left of entry) features a caravan queen size bed with good sized under-bed storage, deep robes with ample hanging space plus slide-out drawers with a small compartment below. There are also two large overhead cupboards with divides, a skylight over the bed, windows either side (albeit the one on the nearside is relatively small), two reading lights, double powerpoints either side, and a TV swivel bracket on the offside. The comfortable living zone (right of entry on the nearside) is designed for pure relaxation, complete with a lounge that will effortlessly seat four people, dining table, magazine pouch on the back of the seating, four reasonably sized overhead cupboards above the lounge plus one small compartment above the Clarion entertainment system. There are also two fold-down hatches at the side of the seating (one housing the battery), two reading lights and two double powerpoints. The practical kitchen (taking up the midriff of the offside wall) will whet the appetite of any caravanner with a culinary bent. It comprises a Thetford Minigrill MK3, sink and tap, three overhead cupboards (one housing a BatteryPlus 35SR) plus switches for the hot water service, air-conditioner, fridge and water heater. There's also a decent sized window, two cupboards under the cooktop, three cupboards under the sink, ample benchtop space with a Samsung microwave above, and four slide-out drawers (including a cutlery drawer) under the benchtop. Adjacent to the kitchen is a 164L Thetford AES three-way fridge, with two shelved cupboards above, and opposite the fridge is a washbasin, architectural tap, mirror and double powerpoint plus a pull-out overhead cupboard above the mirror. Adjacent to the vanity is a shower/toilet combo (one-piece shower and Thetford cassette toilet). Directly opposite is a 2kg Daewoo mini front-loading washing machine, with a benchtop and two linen cupboards below, plus a double powerpoint. And across most of the rear wall is a triple-bunk arrangement (each with a window, a USB port, reading light, and a pouch for holding small electronic devices etc.) There’s also a privacy curtain at the front of the bunks. It would be remiss not to mention that the rear section of the van is ‘cramped’, but the trade-off is a bigger living zone. Externally, the MR20BC is as neat as a pin and contains the necessary prerequisites for on-road travel. It rides on a 4in Preston DuraGal chassis, heavy-duty shackle, alloy wheels and 235x 75 R15 all-terrain tyres. The van's nearside boasts a fold-down picnic table, roll-out awning, two external speakers, full-width tunnel boot with light above, and two external lights. Two rear hatches, ideal for carrying camping chairs, fishing rods etc., are located on the offside. The front of the van has a standard ball coupling on the A-frame, high checkerplate, 2x 9kg gas cylinders (with no stone protection, albeit the gas regulator has a checkerplate guard) and a tap with a checkerplater shield. And at the rear is a spare wheel mounted to a two-arm bumper bar. It's positioned down low and subsequently easy to access. The MR20BC also features a BMPRO control and the main internal light switches (immediately right of entry), rooftop-mounted Dometic Harrier reverse-cycle air-conditioner (front of main bedroom), a skylight forward of the kids’ sleeping quarters, NCE TV/DVD combo, two internal speakers, and a sufficient quantity of LED downlights. However, without nitpicking, I thought the van could do with more in the kids’ entertainment stakes; for example, DVD players and an external TV hatch. There was also no external slide-out barbecue, or the like. Meanwhile, a lot of the weight is to the back of the van, but it’s pleasingly balanced while under tow. I had to return the van from our review location in Warburton to New Age Caravans the next morning, and I was impressed with the way it tracked considering the prevailing high winds. There was only minimal sway when caught up in the slipstream of passing semi-trailers. However, some sway control such as AL-KO ESC would be welcomed. The New Age MR20BC is a ray of sunshine on the family van market. Okay, we all appreciate that loved ones make eternal sacrifices for their children, and that extends to foregoing a plush en suite in this van — but they’ll feel it come back in spades in terms of spending quality time on the road with the family. And if family travel is your whim, then this van will be right up your alley while introducing your young brood to the majestic sights of Oz. The MR20BC simply portrays that it's not only the grey nomads that are the real camping and caravanning enthusiasts.